The agronomist engineer Gustavo Thome Cecchini, born in 1974 in Brazil but of Italian origin, is a knife maker known in the world of knives for more than 10 years. Thanks to his ingenuity and innovative spirit, Gus has received numerous awards and patents (for both technical and design), such as unique assisted-opening, Front Framelock with straight-cut lock-bar, a lock-bar limiter screw, a hidden-clip design that won him Best Innovative Design at the 2012 USN Gathering, the SLT system,etc. With the 0055 model, Zero Tolerance has once again proved that it is able to industrially produce knives with complex geometries, which were once mostly exclusive to custom knives. The blade, dynamic and elaborate, is shaped with a reverse tanto style and has a length of 103 mm and a thickness of 4 mm. In addition to the two different planes on the main bevel, the blade also has a clepsydra tapered spine. Beyond the personal tastes regarding the design, the precision in the working of the various bevels present on the blade is commendable. 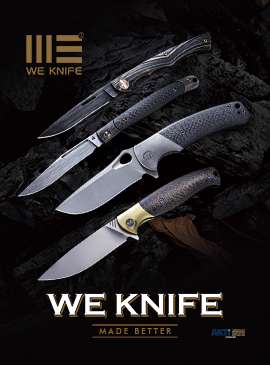 The steel used for the blade of this model, which has a stonewash surface finish, is the CPM S35VN, known for its toughness and resistance to chipping of the cutting edge, as well as for the excellent cutting edge retention. 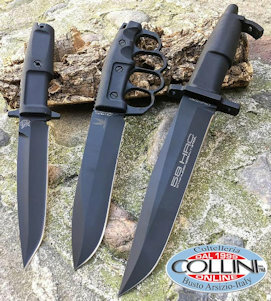 The blade opening is extremely fluid due to the use of ball bearings with KVT technology (Kershaw Velocity Technology),and takes place thanks to the SLS (Spring Loaded Tab) opening system patented by Gus. The system essentially consists of a manual flipper opening, in which the flipper tab is spring loaded and is hidden between the handle frames. Instead of protruding perpendicularly, the flipper tab protrudes slightly from the profile of the handle parallel to it. Simply pull it back with the index finger and bring it to the perpendicular position, so that it acts like any other flipper system: by levering the flipper tab, once the detent ball has been won, the blade will move to the open position. The SLT system therefore has the functional (but also aesthetic) advantage of not having protruding parts from the back of the handle, while maintaining the usability of the flipper opening. The frame lock mechanism is directly on the titanium frame; a steel insert has been added on the locking spring, which acts as an interface with the blade tang, to prevent the titanium (of a lower hardness than steel) from becoming worn and causing problems to the locking system. Moreover, the insert also has the task of avoiding the hyperextension of the spring during the release of the blade. All mechanical couplings, as always when we speak about Zero Tolerance, are made to perfection and when the blade is opened it is firm and free of play. The handle, which incorporates the modern character of the blade, is entirely made of milled titanium. Also inside, to further lighten the knife, the frames show some milling. In the front part of the handle you can see the total absence of screws (with the exception of the pivot), which gives greater elegance to the whole knife. The particular pivot and the blue backspacer in anodized aluminum further embellish the ZT0055 and constitute the elements that hold the structure together. From an ergonomic point of view I did not particularly appreciate the geometry of the handle in the portion where the index finger is placed, which is wider than the one where the last fingers of the hand are placed, making it not particularly effective and the grip on the instrument was quite uncomfortable. The equipped pocket clip is simple and not particularly accurate in design, unlike the rest of the knife; it is configured for the ambidextrous tip-up carry. On the bottom of the handle there is also a lanyard hole. Currently, the price of the ZT0055 for the European public is between 250-260 euros, in line with the majority of Zero Tolerance products. The knife has been qualitatively tested, performing cutting tests on some common materials (such as paper, cardboard, and so on). The factory sharpening is always at the top when it comes to Zero Tolerance; in this model you have to get used to the particular geometry of the cutting edge, especially for those who, like ,me who do not like this kind of futuristic blades, but other than that the knife sharpening is excellent. Despite being a gentleman’s knife of considerable size for its category, the ZT0055 is slim, relatively thin, rather light and has an original and aggressive profile. For lovers of futuristic designs it is certainly a product that combines quality of materials and workmanship with a daring design signed by GTC.